It's the second time he's mentioned her smile at a debate. 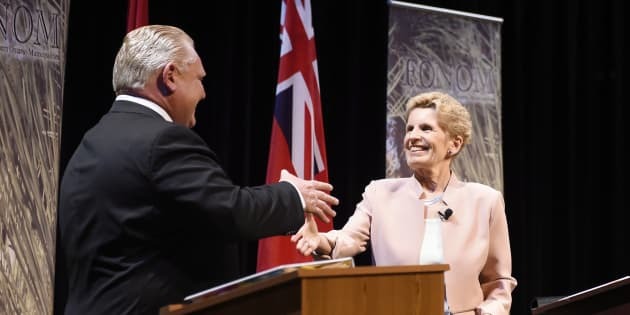 Ontario Progressive Conservative Leader Doug Ford, left, and Ontario Liberal Leader Kathleen Wynne shake hands after taking part in the second of three leaders' debate in Parry Sound, Ont. on May 11, 2018. One of the stranger moments in the Ontario election campaign's first debate saw Progressive Conservative Leader Doug Ford tell the province's premier she had a "nice smile" on her face. On Friday, at the end of a second debate focused on northern issues, Ford wrapped up his closing remarks, shook Kathleen Wynne's hand, and told her "I still like that smile." After the debate, Wynne was asked by reporters about Ford's comment. "I just turned away because I'm not sure what my smile has got to do with making good policy for the north or anywhere else in the province," she said. The premier's comments echo her reaction at the end of her first showdown with Ford earlier this week. During a debate hosted by CityNews Toronto on Monday, Ford was given the chance to ask Wynne a direct question of his own choosing. Before he quizzed the premier, he said: "Kathleen, you got a nice smile on your face there." The comment didn't sit well with some viewers following along on social media. Some called Ford's remark "gross," while others described it as patronizing. Though Wynne seemed to laugh it off at the time and told Ford he had a nice smile, too, she had a different message after the debate was over. "There are many of us who have come to expect that kind of comment, that kind of behaviour," she said in a scrum with reporters, adding that the remark was not a "substantial" discussion of policy. According to CBC's Mike Crawley, Ford did not hold a press conference after Friday's debate, so reporters could not ask him why he mentioned Wynne's smile again. Ford spokeswoman Melissa Lantsman, however, said in a statement that it the remark was just a "reminder to always keep things friendly." "Doug Ford made the same comment after the second debate as a way of saying they are rivals on stage, but he respects her," Lantsman said. "It was nothing more than that."